Jim Koch, the founder of Samuel Adams brewery, is a fifth-generation brewmaster. 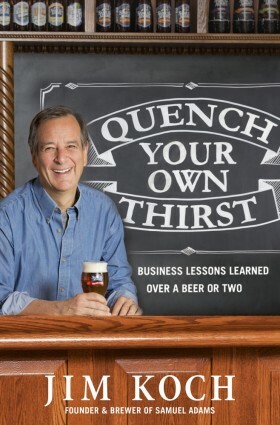 In his new book, Quench Your Own Thirst: Business Lessons Learned Over a Beer or Two, he recalls the when starting Sam Adams of wasting a lot of time and potentially a lot of money trying to figure out which computer system to use. His uncle offered some sound and blunt advice. “I’ve never known a business to go bankrupt for a lack of computers but I’ve seen many go bankrupt because of a lack of sales.” In other words, go sell some beer. Jim took the advice to heart and literally drove to a handful of bars that afternoon, met with the bartenders one-by-one and sold some cases of beer. One thing that made him stop stressing out about the business was getting his hands dirty in the entire process, including being the company’s chief salesperson. Of particular interest to the smart orthodontist, chapter 12 on Koch’s “string theory” and running a lean company, chapter 25 on the unfaithful friends and genuine enemies you will attract if you are successful, chapter 29 on speaking up to make a better company and chapter 39 on the importance of continuous training. I’ve always admired Koch from a distance for his leadership style, commitment to a great product and for not shying away from the importance of sales. He dismisses the notion that we have “markets” and “target demographics.” He says, “you don’t sell beer to markets and demographics, you sell them to the people who will actually buy and drink beer.” The best companies on the planet understand that everything really boils down to being in the people business. This book from Koch is a wonderful look, behind the scenes, at a great leader and should be on every orthodontist’s list to review with their team leaders.